Largo, Florida is located just south of Clearwater and is the 3rd largest city in Pinellas County behind St. Petersburg and Clearwater. The town was founded in 1905 and grew rapidly through the 1910s and 1920s as an agricultural community. It was known as "citrus city" because of its large orange and grapefruit packaging and shipping center. After World War 2, Largo's population grew rapidly once again. Gradually, the farms and citrus fields were replaced by suburban housing developments, shopping centers and electronics manufacturing and sales companies. Today, Largo is a bustling suburban community of 70,000 with convenient access to Gulf beaches and Tampa Bay area events and cultural activities. If you're looking for a Largo pool builder to make your back yard a unique Largo outdoor living space for you and your family, consider Grand Vista Pools. 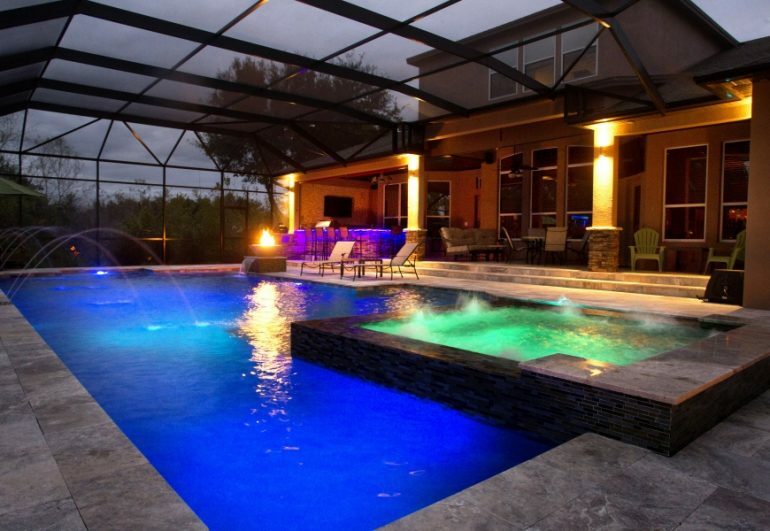 We've been building new swimming pools in Largo, Florida and the surrounding area for decades. One of the things that makes Grand Vista Pools special is that not only are we an experienced pool builder, but we're also a licensed general contractor. This means we can design and build your entire outdoor living space including making renovations to your home to help your indoor living space and outdoor living space flow seemlessly together. Do you have an older Largo swimming pool that needs remodeling? Grand Vista Pools can help you with that. We do everything from basic pool resurfacing to extreme makeovers. Want to add a hot tub? A waterfall? Lighting or fire features? We can do all of that and more. Grand Vista Pools also has a lot of experience designing and building Largo outdoor kitchens. If you can dream it, we can design and build it - from an amazing outdoor grill to a fantastic full-featured kitchen to a relaxing outdoor bar. Give us a call, and let's discuss your outdoor living ideas.